This peanut butter and jelly snack mix is full of all the flavors of your favorite sandwich! All the delicious taste of a PB&J in a crunchy, sweet and salty snack! I don’t know about you but when I think of back to school, packed lunches and after school snacks there two things that leap to mind. Peanut butter and jelly sandwiches and Goldfish® crackers!! I mean who doesn’t have memories of opening a brown paper bag and pulling out a tasty pb&j? Or what mom hasn’t handed her child a dish of Goldfish crackers and some fresh fruit after a day of school or play? I know I have! 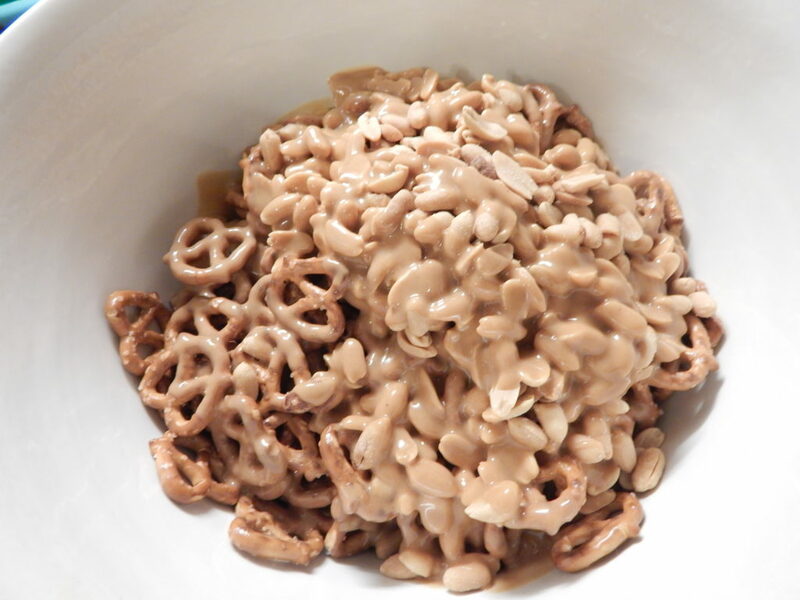 In fact the inspiration for this tasty snack mix came from my little man’s lunch! A peanut butter and jelly sandwich (with the crust cut off of course) a dish of Goldfish and fresh strawberries. I thought… why not combine these delicious flavors into a snack mix? What would be better for snacking all day, packing to-go or an after school treat than a crunchy, sweet and salty peanut butter & jelly snack mix? This recipe is so easy and combines all is bursting with delicious flavor, what could make it more simple? You can even save $1.00 on any 1 Bolthouse Farms® 10 oz. Baby Carrots or Bolthouse Farms(® 11 oz. 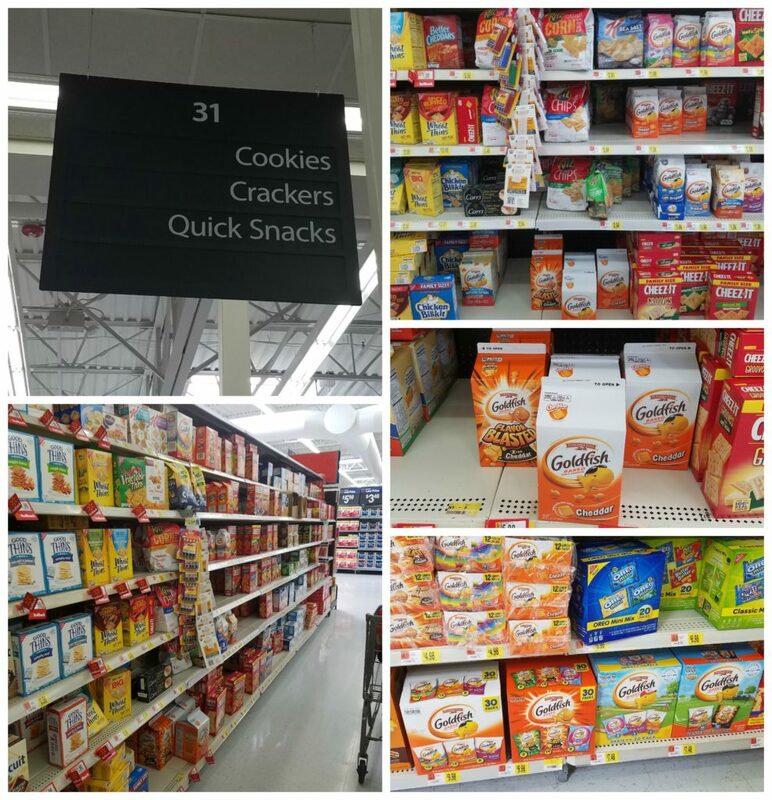 juice when you buy any 1 Pepperidge Farm® Goldfish® crackers 30 oz. or larger. You can pick up all you’ll need for this recipe along with the rest of your lunchtime essentials all in one quick trip! I grabbed a variety pack of snack size bags along with a big 30 oz. box of Goldfish crackers! 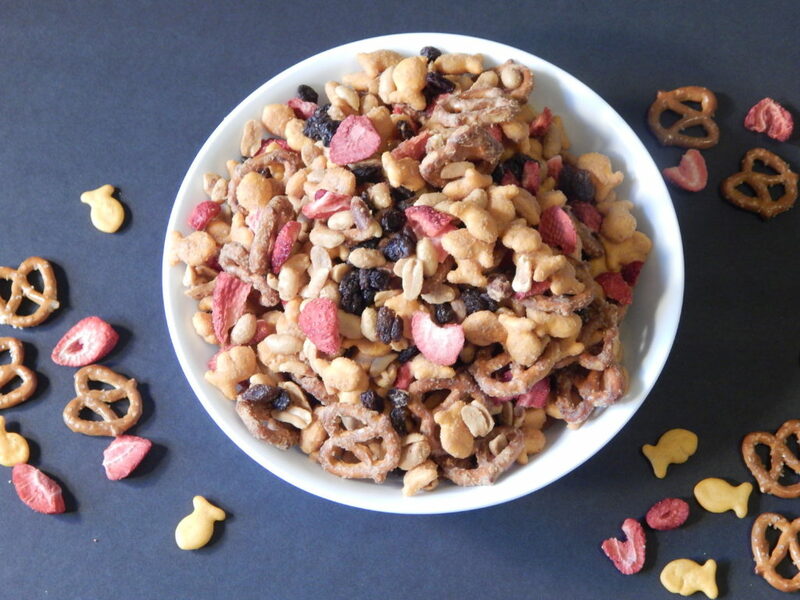 I knew I’d need lots to make this snack mix and have some for even more snacking! First thing you want to do is preheat your oven to 250, line a cookie sheet with parchment paper. Now in a small pan or microwave melt your butter. Add in the peanut butter and stir until smooth and well incorporated. In a large bowl combine your Goldfish, pretzels and peanuts. Pour your peanut butter mixture over the top. Now stir until everything is evenly coated. Pour the mixture out on your prepared baking sheet and spread it out. Pop it in the oven. Bake for 1 hour, stirring every 20 minutes. Remove from the oven and let cool completely. Once it’s nice and cool stir in your raisins and strawberries. All done! Your big bowl of peanut butter & jelly snack mix is ready! 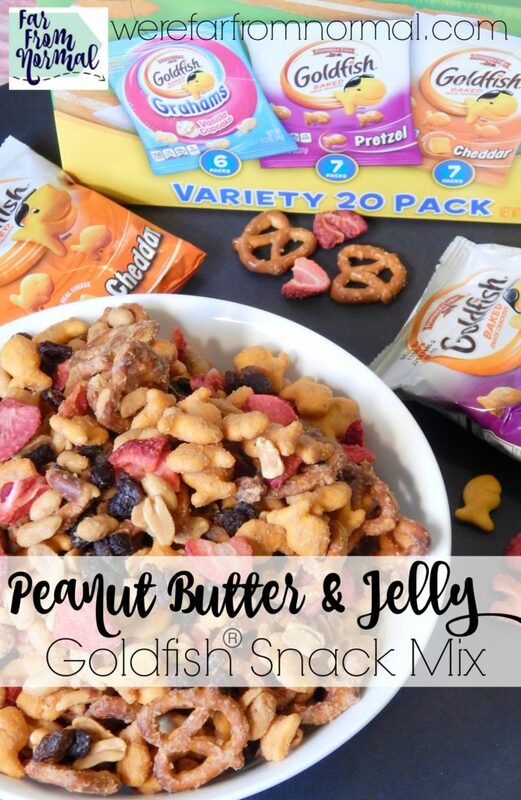 Now you have all the tasty flavor of peanut butter and jelly mixed in with fun little Goldfish crackers! 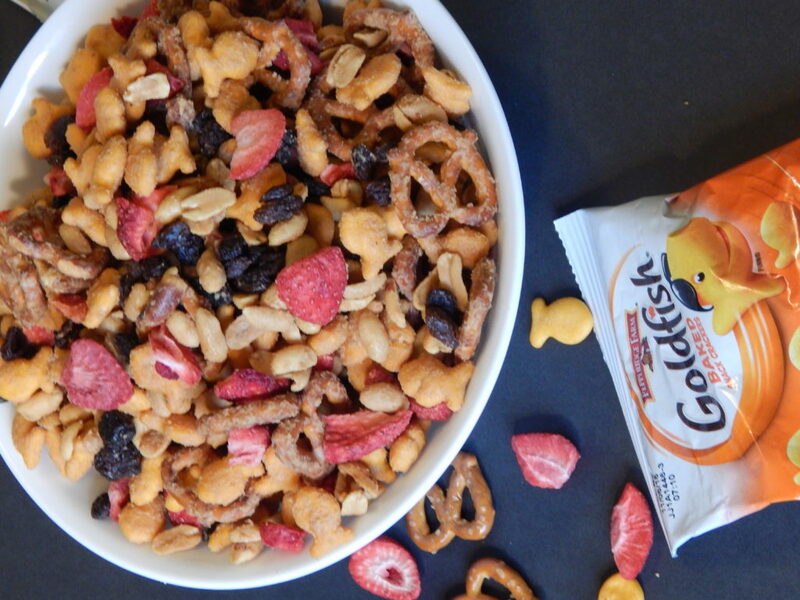 What is your favorite way to snack on Goldfish crackers? Do you eat them plain or pair them with another favorite? Oh, YUM! This wouldn’t last a day in my house. It’s absolutely awesome.